When building a sewer jetter there’s a tradeoff between using a lightweight, small-diameter hose that’s flexible enough to move easily through clogged drains, and a larger hose that’s costlier, less flexible, and can be more difficult to feed through a sewer line. While small-diameter jetter hoses have their advantages, there’s a big performance penalty – and the potential to overload your pressure washer or pump – if you choose too small a diameter. The red area of the chart shows pressure drop through the 1/8″ sewer jetter hose. This is calculated using a formula that accounts for the length, geometry and material of the jetting hose, flows and other factors. The formula was validated in our own tests. Notice that for all flow (GPM) conditions the pressure drop through this 1/8″ ID (inside diameter) hose is much greater than the pressure drop introduced by the nozzle. This means that most of the pressure washer’s power is lost inside the hose, and there’s little potential force for the nozzle to clean the sewer line or create a strong pulling action to draw the jetter through the drain. You’ll also notice that the total pressure drop in this system will overload just about any pressure washer. For example, we haven’t seen a 2.0 GPM pressure washer that can handle the 4,800 PSI pressure drop produced by this jetter hose and nozzle at that flow. Can an ordinary 2.0 GPM pressure washer still move water through this combination of jetter hose and nozzle? Yes. You’re likely to see a continuous, rapid cycle of pressure buildup, followed by the pressure washer unloader valve shutting down the flow when the pressure washer’s rating is exceeded, followed by the unloader valve opening again once the pressure drops. Water moves intermittently through the line, but the rapid cycles of spiking pressure can shorten the life of your pressure washer. When we developed the Clog Hog drain cleaner we used our proven formulas – along with knowledge about the manufacturing tolerances of different sewer jetter nozzles – to design ready-to-use sewer jetters that clean efficiently without overloading your machine. In our next article we’ll show how to choose a sewer jetter nozzle. 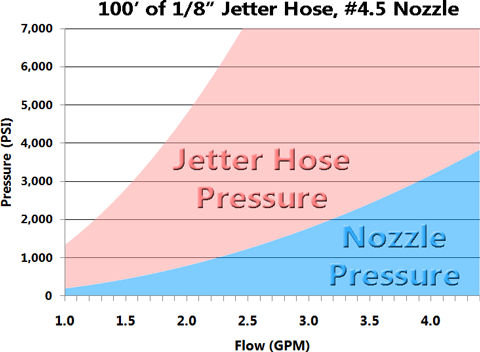 You’ll also find a chart showing the pressure drop of different sizes of hose in our article about pressure drop in a sewer jetter hose.